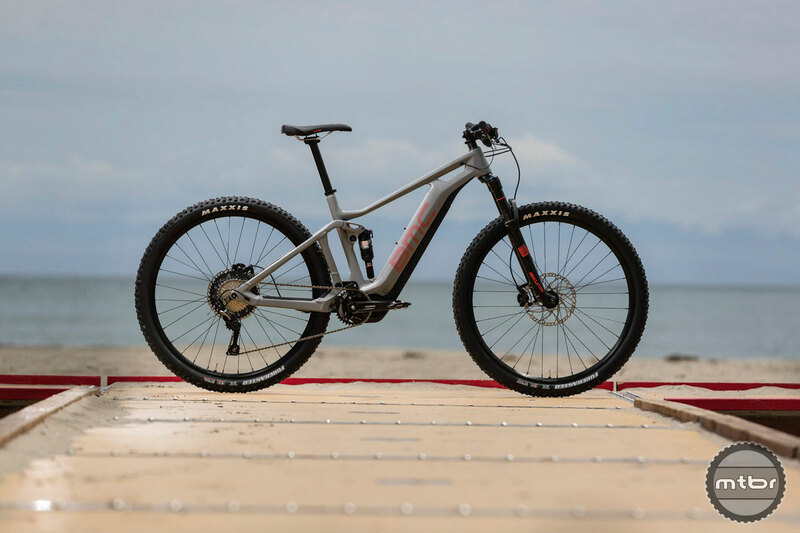 The Speedfox AMP (for “Amplified”) is the Swiss bike manufacturer BMC’s 29” 130mm travel trail bike powered by Shimano’s 250W electric motor and 500Wh battery. The easily removable battery is hidden within the frame and the result in a great looking bike, unlike other E-bikes that look like someone just bolted a car battery onto the downtube. It’s a Class 3 E-bike which means the motor limited to 20mph and only works when the rider is pedaling. The ride to from the wharf to the trail network more than five miles away is usually a chore but not this time. 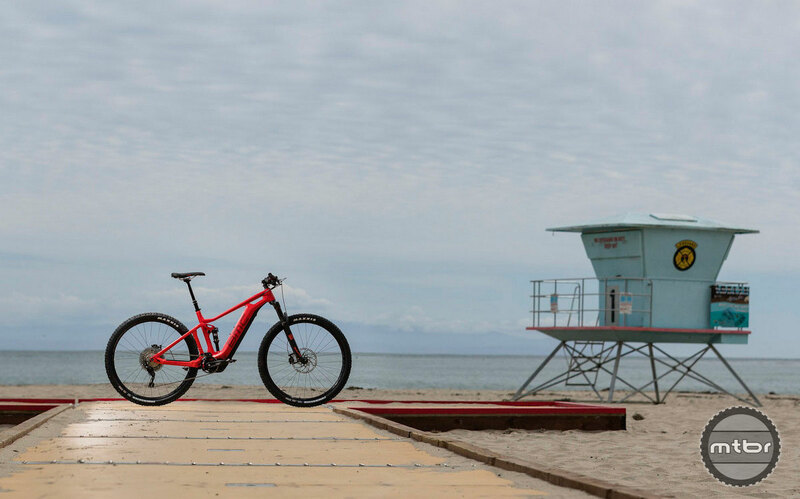 The AMP also sports E-bike specific components such as stronger wheels with beefier spokes and a stronger freehub to handle the added torque of the electric assist. Four-piston brakes with massive 200mm rotors bring this 45lb+ bike to a stop with room to spare. 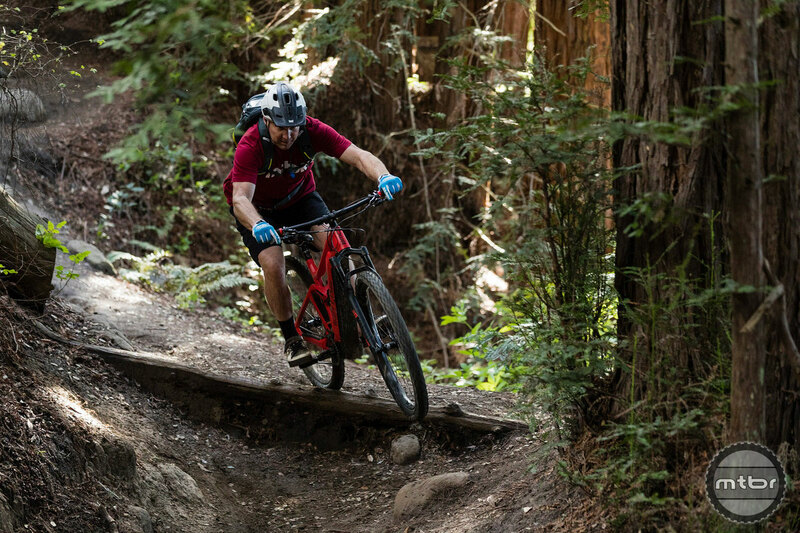 The stunning town of Santa Cruz was the venue as the local trail, Wilder State Park was recently opened for e-bikes. I’m a larger rider at 6’2” 200lbs and I tend to prefer challenging technical downhills but am not averse to climbing. 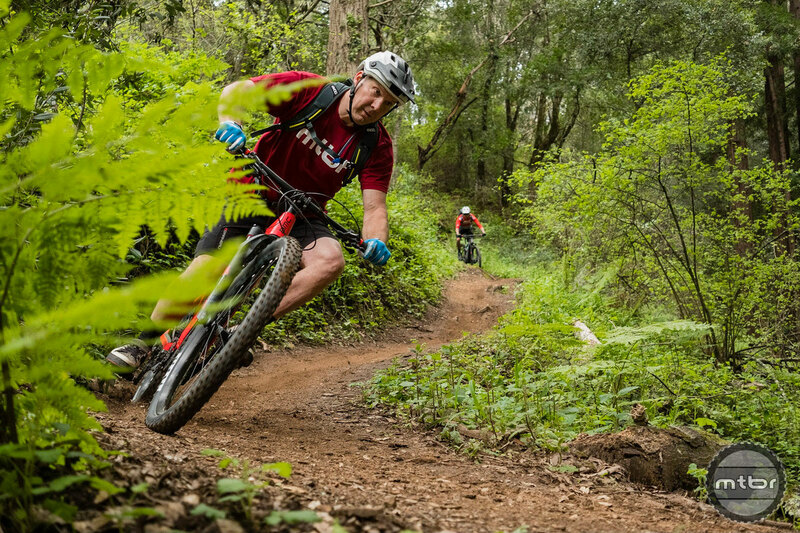 For my test ride, I picked Wilder Ranch in Santa Cruz for its variety of terrain from rutted fire roads to steep and technical singletrack. On the climbs, the Shimano motor delivered plenty of smooth power with 3 levels of assist; Eco, Trail, and Boost. I rode a majority of the time in Eco mode which had plenty of assistance to keep me smiling. On the steeper climbs, I would briefly switch to Trail or Boost modes. Strangely, you actually start looking forward to steep, rooted, and rutted climbs that you used to dread. At the end of the 30-mile ride, I still had about 20% left in the battery and fairly fresh legs. There’s interesting trails in those woods. 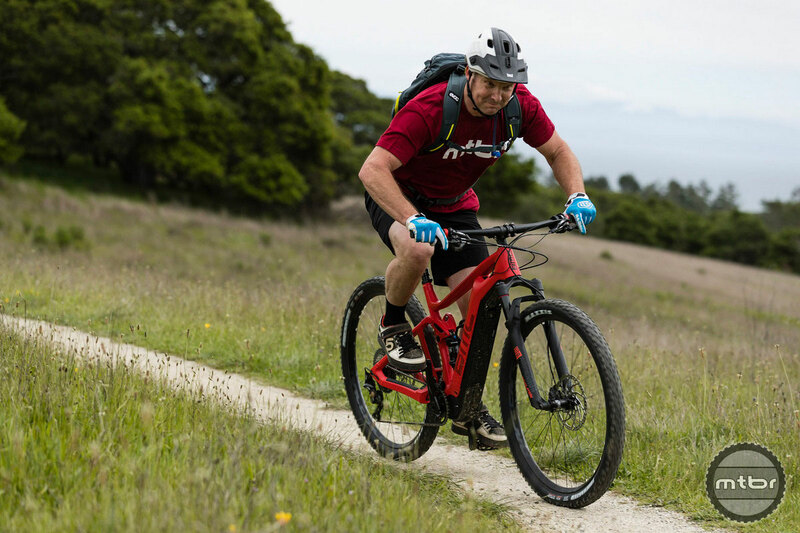 The RockShox Revelation 130mm fork up front and Fox Float DPS shock in the rear work well to smooth out a majority of the trail chop, and even soaked up some unexpected medium sized rock drops without causing any drama. The 29” wheels blast over the smaller roots and rocks and allow you to carry a ton of speed. 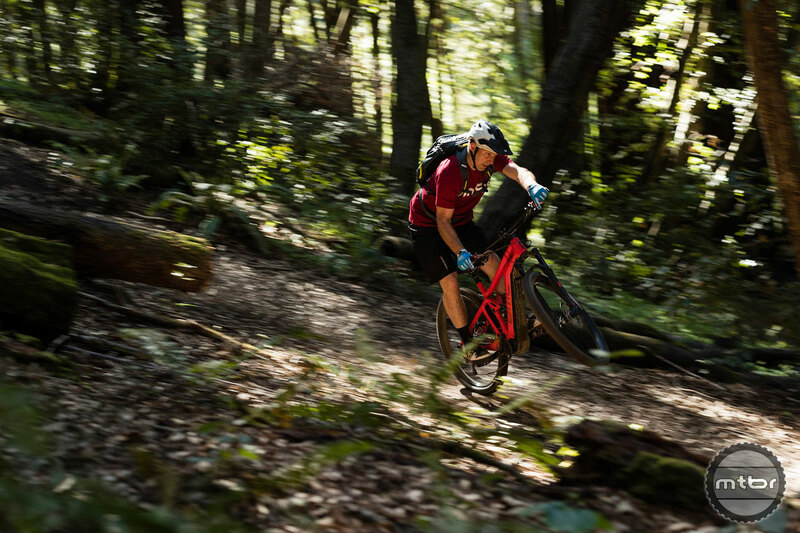 If you regularly tackle extreme terrain or are a larger more aggressive rider, the longer travel Trailfox AMP with 650b+ wheels may be a better option for you. The Speedfox was playful on the Zane Grey trail. The handling is very neutral; in fact, the added weight made the bike feel more planted on the ground and less twitchy on the jumps. The front tire tracked well and the rear end with its oversized bearings handles hard cornering and berms without any chatter or flex. You often forget you are on an E-bike until you come to the next uphill and start grinning again. Bunnyhops, wheelies, and other sorts of mischief are possible on this bike; they just take more rider input due to the added weight. 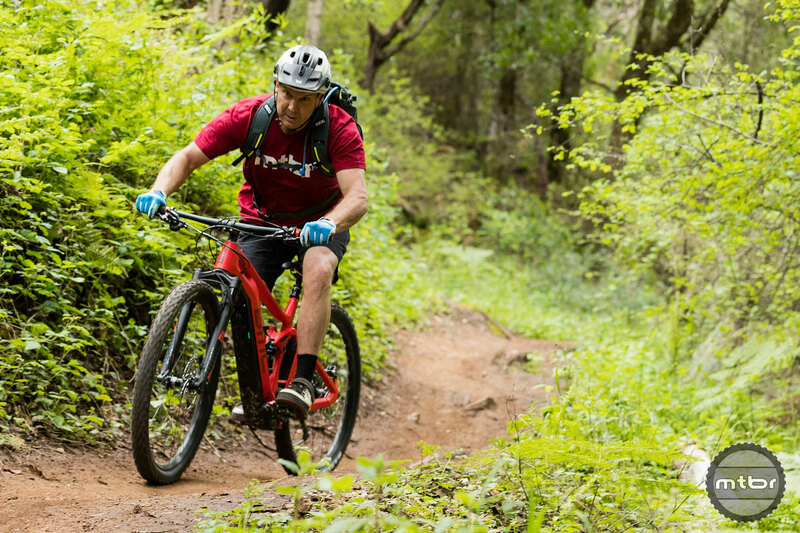 The compact Shimano motor allows for the shortest possible chainstays making this a playful and lively trail bike despite its weight. The Speedfox chassis is stiff enough and fun enough. 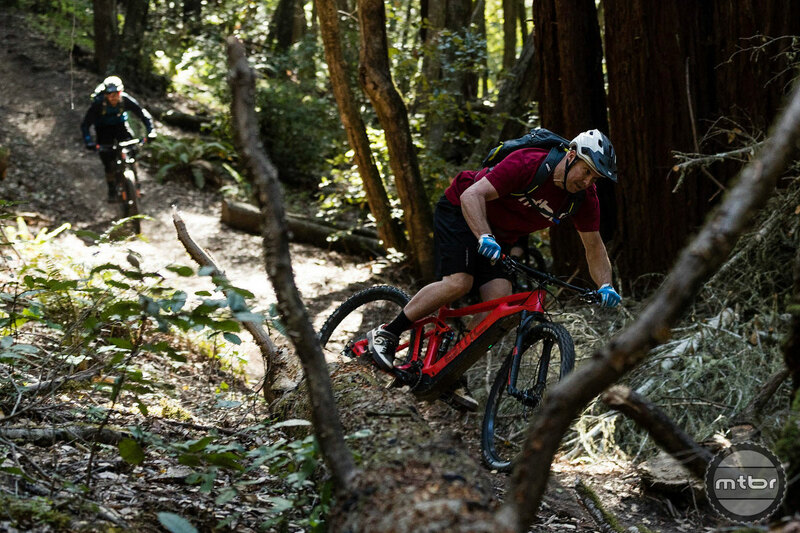 The Speedfox AMP is labeled as a “Trail Bike” and the 29” wheels and power assist are great for covering a lot of ground quickly allowing for more riding in a shorter period of time. Racers will enjoy riding this in their recovery days, and weekend warriors with limited time can get a great ride in and still be back in time for the other weekend activities. For me, E-bikes are just a blast to ride and the AMP is a very well executed example of how capable these bikes have become. The crew heads back down to the beach. 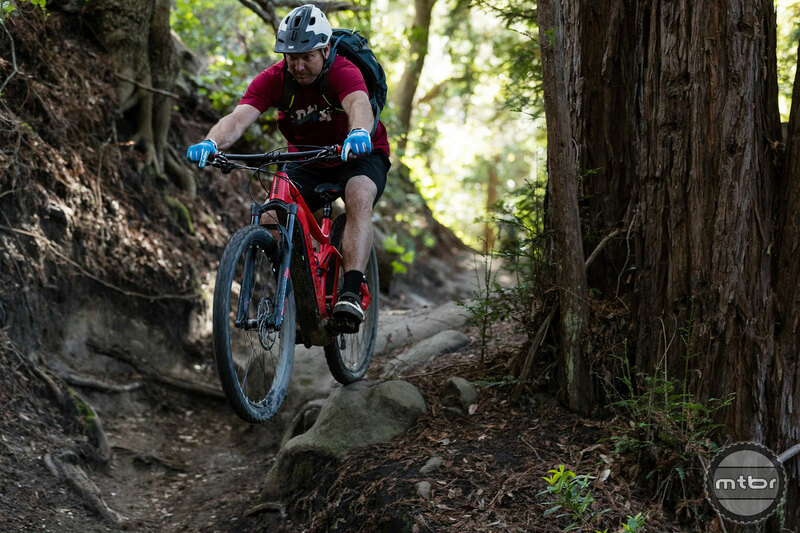 BMC’s AMP e-MTBs are currently available at participating dealers and starting on April 19, 2018, customers in the USA will be able to order AMP e-MTBs online and receive the bikes at their local BMC retailer. All smiles and no cars were involved on this day. For more information, visit amp.bmc-switzerland.com. 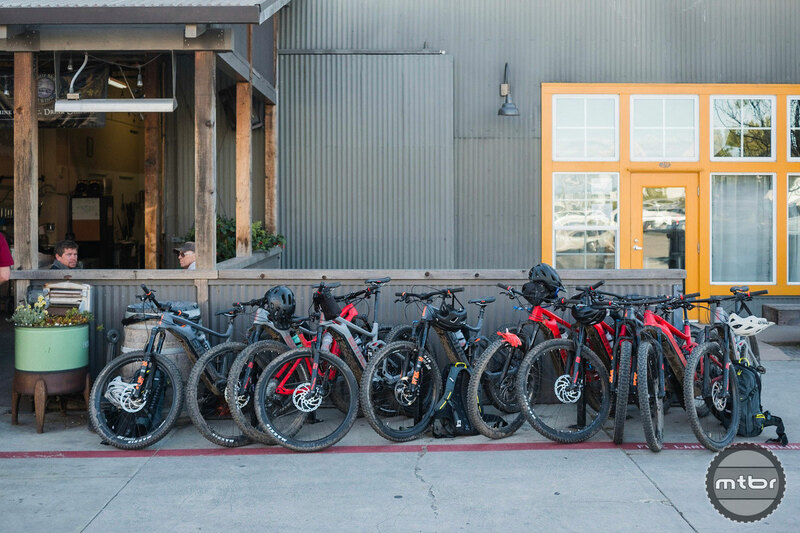 The stunning town of Santa Cruz was the venue as the local trail, Wilder State Park was recently opened for ebikes. What’s the activity type on Strava? Cornering was neutral and the weighted front tire had plenty of grip. There’s three models of Speedfox available from $4799 to $7499. 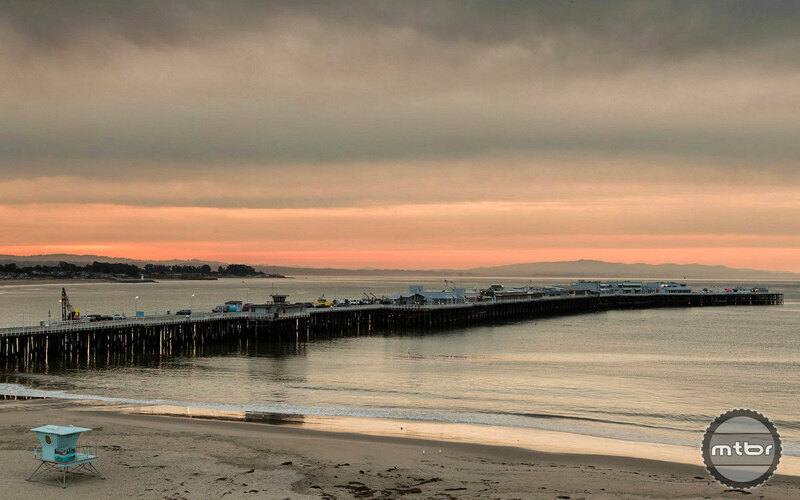 Wilder State Park is blessed with ocean views and pockets of redwood groves. Even on the first ride, the heavier bike is easy enough to handle. It’s not rear heavy. 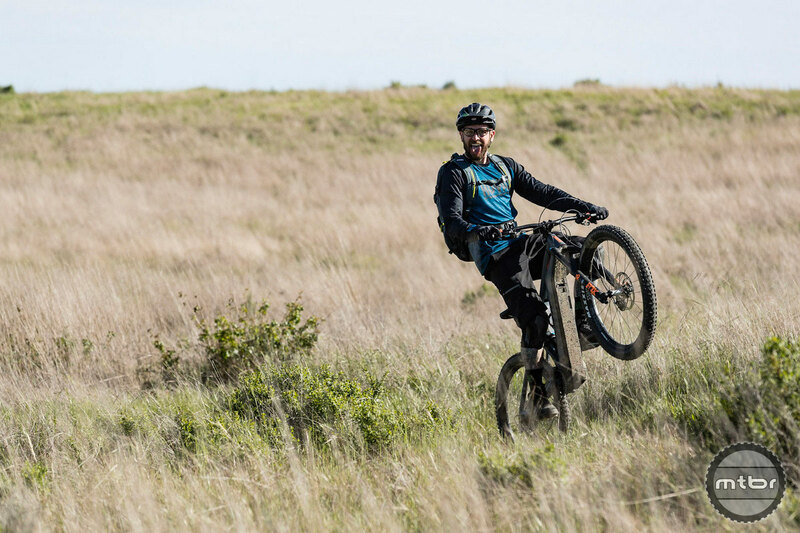 That’s just a good rider having fun. The motor and battery won’t teach one how to wheelie but it certainly won’t prevent one. So basically if your buds don’t have an e-bike you’re solo. Seems awful heavy for an e-bike. 45+ lbs is min weight then ? What about actual ? 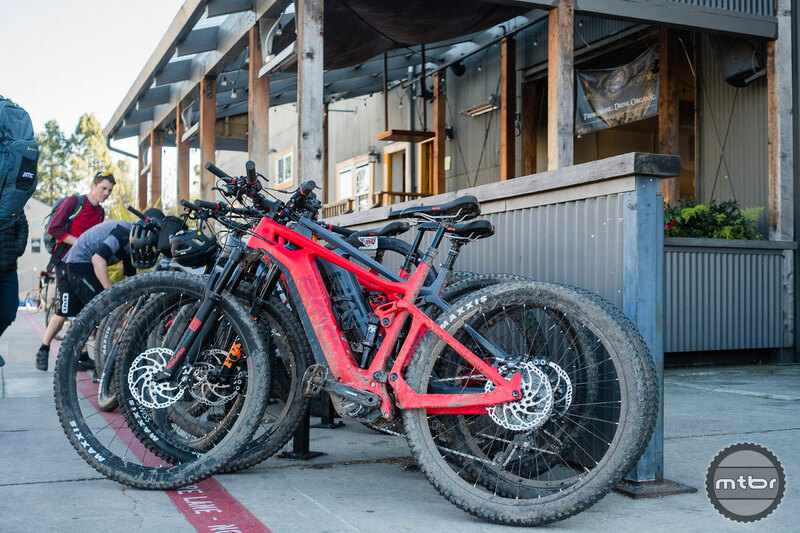 45lbs is relatively light for an ebike, the Specialized Turbo Levo is closer to 50lbs. 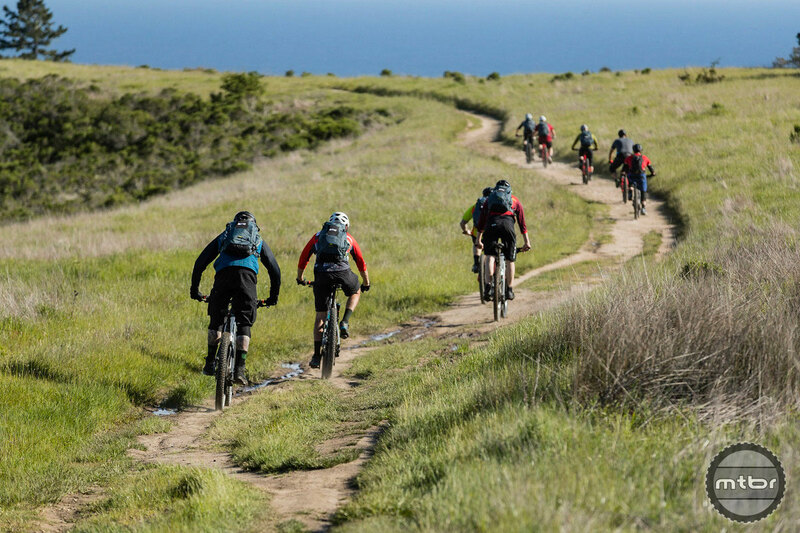 As for riding with your buddies, since the level of assist can be programmed, you can tone down the amount of assist so that you are equal to who ever you ride with. If you are riding with your racer buddies who are faster than you, you can turn it up a bit so they don’t have to wait for you. If you are riding with your slower buddies, you can adjust it down so it’s providing minimal assist. Most people that complain about e-bikes haven’t ridden them. I understand the argument that it could hurt trail access, because people think they are like motorcycles. 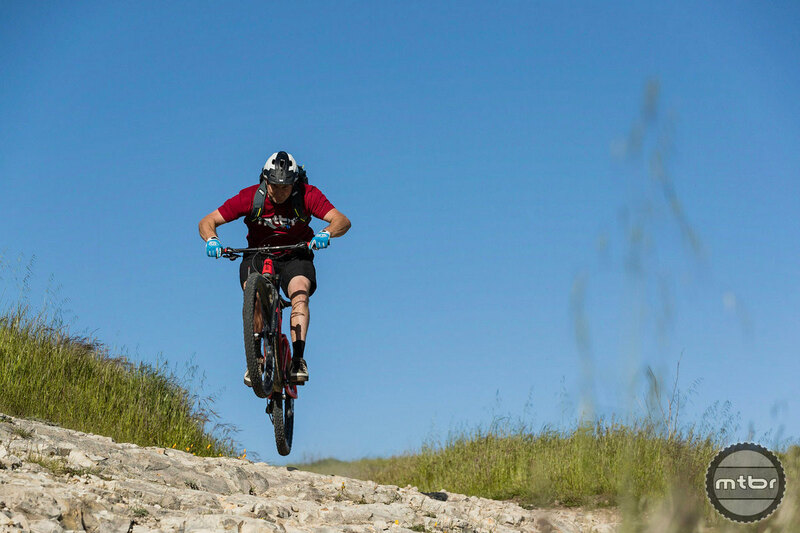 But in reality what will likely happen is they will enable more people to get into mountain biking and will provide a larger voice to make a case for even more trails. Some good points thanks ! Correct I have not ridden one although an old(er) now and yes injuries adding up. Maybe one day maybe not. MTBR – please get a separate URL for the e-bike content. Love this. My regular MTB buddies are damn near world class athletes. Its so nice to not have them waiting on me. Also really loving my long 40+ mile days in the saddle without it completely wrecking me. Thanks MTBR! This new BMC looks great. Don’t listen to the handful of loud voices that say you shouldn’t write about these mountain bikes. I love my Focus, and really love the 40+ mile days I put in without being so wrecked I can’t ride the next day. Why do you keep reporting on electric mountain bikes when 99% of the readers here are against them? And it’s $7500! Start a new site for electric bikes and keep them out of here, please! That’s class 1 ebike, bro. Pretty expensive. 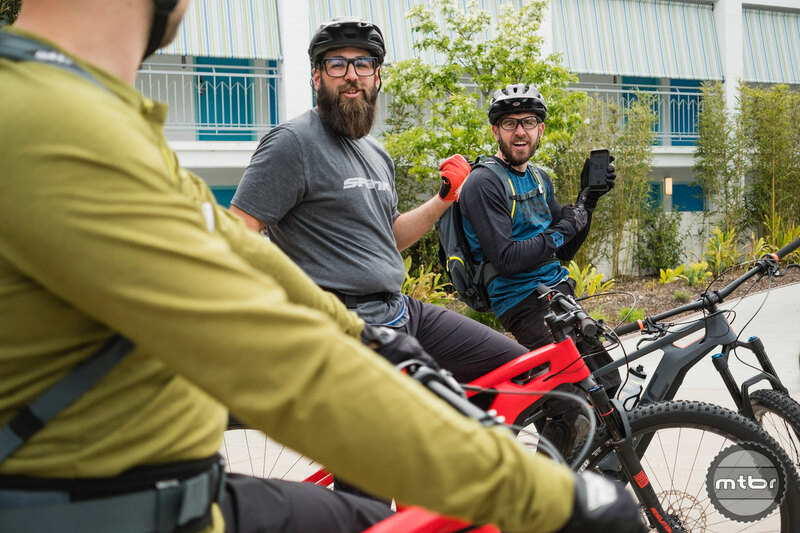 Don’t hate on E-bikes until you experience the pure fun! You are all missing out. Scotch Hennessy: I have no doubt they are fun on the motorized trails. That’s where they need to be not on MTB trailsa. We don’t need no stinking E bikes. We ride real pedal powered Mt bikes. Keep writing about ebikes guys! Go on riding your cro-mo full-rigid 26″ 5-speed converted beach cruiser on the same old trails, Juan. We the “1%” will have fun without you. dirt rider: Sounds good to me. Pedal your electric bikes until the batteries are dead just don’t ruin the pages of this site with them. Please just stop… stop forcing a sport not related to the sport I enjoy on a website I enjoy that is supposed to be about Mountain Biking. I don’t want to hear about road bikes, e-bikes, motocross, RC Cars, etc.. on a mountain Bike Specific site… just stop. I have ridden one and they are fun to ride but they are not the same as mountain bikes. Can you please start an eMTBR.com and do away with the blurred lines? Another vote for enough of the e-bike BS!!! We don’t want them!!! I ride my All Mountain 5.0 Haibike when with my 14 year old son. I’ve been able to show him so much more terrain without waiting at the top of each climb. We can go out for 20 mile rides with over 2500 ft of climbing. It’s been an amazing tool to share the sport mountain biking with him. We ride our non e-bikes too…just not the distances we can go on the e-bikes. Also, this is a full suspension bike! Please MTBR just stop posting articles on full suspension bikes. I don’t want to hear about them and they’re ruining my sport. Actually, I don’t even them consider them a bike – motorcycles have full suspension not bicycles. So please just stop. I ride mostly single speed and geared on occasion. I could put my nose up and claim geared bikes fall into the spectrum of pedal assist (i.e. motorbike, ebike, etc) and that geared is not pure mountain biking. But I won’t. I am all for progression, and new technology, so that more can participate in our great sport. So yep, I am all for e bikes. In a few years, they will get those batteries so small and tucked away in the frame, you won’t notice. And guess what? The naysayers will be the ones to jump in. Why? Hoping to gain that edge they don’t have now. Kind of like how crazy we get to buy the high-end bike to save a pound or two just be a little faster. Go ebikes!